Shauna Zamarripa, of Yahoo's contributor network, knows a little something about home values. As a realtor and a financial writer, Shauna recognizes the need for homeowners to complete major remodeling and renovations projects as needed. Afterall, as many realtors will tell you, great kitchens sell homes! But what's great about Shauna's list below is that she has listed 5 easy and low cost home improvements that pack a big punch! These are great do-it-yourself home improvements to do prior to resale, before a major event at your home or just to spruce up a little for spring! "When I was working in real estate, I often ran across homeowners that did not have the resources available to facilitate full remodels of their kitchens and bathrooms when putting their home up for sale. However, over the years, I came across several do-it-yourself projects suitable for any homeowner. Home improvements, upgrades and changes are a part of life. After a while, aspects of every home, from the kitchen to the bathroom, need updating and improving. For some owners, it is a need to upgrade a few items to promote a faster home sale. For others, the intent might be just to spruce up a room that looks drab and dreary. Whatever the purpose, here are five high-impact home improvements every homeowner can perform -- even on a shoestring budget. A fresh coat of paint livens up any room. Virtually any room in your house can be primed and painted for around $100 including paint and supplies. In addition, painting worn out cabinets in kitchens or bathrooms or purchasing a do-it-yourself refinishing kit is a project that can be done in a day or two, adding appeal and value to any room. Changing out door hardware throughout the interior of your home, or making some changes to an external doorknob or fixture improves the look of eye level door knobs without breaking the bank. You can buy new hardware from websites like Overstock.com for an entire home for around $100, or new outdoor hardware for around $50. While it may not seem like much, the little things can add substantial value and appeal. Light fixtures come in a variety of shapes, sizes, colors and designs. Upgrading and updating light fixtures is another great home improvement that pays off without costing a lot of money. You can buy a single light fixture for under $100 and still have money left over for energy efficient bulbs. Nothing breathes live into a tired kitchen or bath like new knobs and pulls on drawers and cabinet faces. The best news is that this is a simple do it yourself project, completed in about an hour and requiring only a tape measure, screwdriver and power drill. Dress up bathrooms with new mirrors. Wall mounted mirrors with Hollywood bulbs can seem cheap, since they are often are builder stock items. 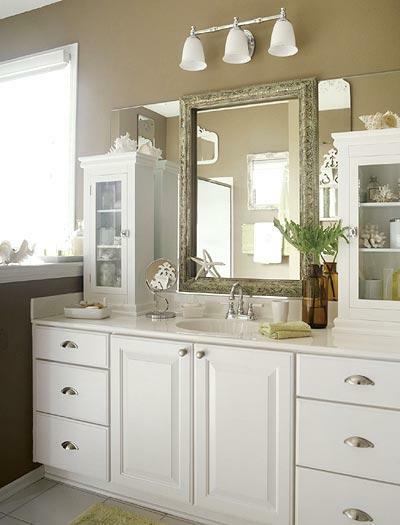 Purchase a new mirror with a pretty frame, and hang it in any bathroom needing a facelift. Most large mirrors will cost between $75 and $100, making these a cost-effective upgrade."